You need advice that works. Advice that is focused on long term growth, not a short term growth spurt that flat lines after a few months. So if you care about your blog’s long term growth and you want to know how to approach link building, read on! I’ll show you how to get featured on sites like Huffington Post, mentioned by influential bloggers and how to future proof your search rankings by giving Google what it really wants. Most link building advice is about staying under the radar and pulling the wool over Google’s eye’s for as long as possible. The advice I’m talking about is against Google’s Webmaster Guidelines and usually involves tactics such as low quality guest posting, blog comments, web directories, link directories and private blog networks. Going down that route will just cause you problems later on. You can try to stay under the radar but Google will catch you, they’re a smart bunch. And when they do, you’ll get penalized and see a savage drop in rankings followed by sharp traffic drops. This is usually due to receiving a penalty (manual and/or algorithmic) which takes a huge amount of work to recover from. Or they can be very costly if you outsource the work. The truth is that the blogs and online businesses that have thrived have been savvy enough to keep thinking 5-10 years ahead – that’s what we all need to do. I’ve seen plenty of labels applied to those in the SEO industry and the tactics used, that includes white hat, grey hat and black hat. The lines are blurred here and there’s always been debates on what they all mean. …The way it always should have been done. I particularly like Eric Ward’s position on this. He has been building links since before Google existed. It’s these things that will help you grow your blog and ensure its long term viability as a sustainable business. And that’s what really matters isn’t it? The alternative is that you get some quick success followed by a sharp and disappointing nose dive when Google rolls out another Penguin update (I’ll talk more about Penguin later on). Any link building campaign needs to be built on a solid foundation. 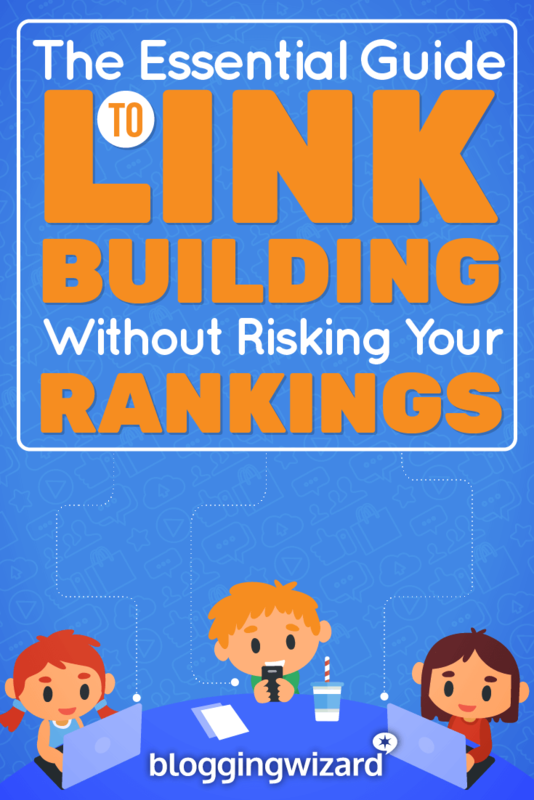 Below we’ll talk about how you can fine tune this natural link building approach and build on it to rapidly improve your rankings, traffic and authority. We need to prioritize our link building efforts. I’m often asked what a good link looks like but I believe that a good link goes beyond any existing SEO metrics. We need to move away the isolated view of just thinking in terms of the SEO impact of a link and expand to incorporate engagement metrics. The truth is that SEO is just one part of the puzzle and when we really think about it, isn’t SEO just a means to an end? SEO isn’t the ultimate goal and it never should be – it’s time to think about the big picture. It really comes down to what makes a good mention. For example, a mention on a website without a link back to your blog can be helpful in various ways. For example being cited as an expert on Huffington Post can make for great social proof. All of these elements come together to build a picture of how helpful a website can be to increasing the visibility of your blog. Link building doesn’t exist in isolation. It’s just a small cog that fits into a larger and more cohesive marketing strategy. It should be used in conjunction with other promotional channels to help you get the results you deserve. Content and social are especially helpful when used to help your link building efforts. Most tactics that I’ll talk about in a moment will involve the creation of high quality and extremely helpful content. The most straight forward piece of content to create is usually the good old blog post. When you create your content, it’s worth mentioning influential bloggers in your niche and linking out to helpful content where possible. I’ll discuss how you can leverage these mentions in a moment. Think of your content as linkable assets, you can use them to help connect people to great content that will entertain them or solve their problems. Once you’ve published your content, whatever it may be, it’s now time to get it in front of the right people. That’s where social media and other content distribution tactics come into play. Social media is perfect for exposing your content to a wider audience. The more people that see your content, the more chance you’ll have of earning links from other blogs. It’s important to grow your own social following but social media doesn’t just have to be about reaching your own followers. We already covered how you should mention influential bloggers and their content – you can use social media to let them know you’ve mentioned them. People love it when others say awesome stuff about them, and there’s a good chance they’ll share that content because it increases their perceived authority with their audience. When their audience sees that the blogger is getting mentioned on other blogs and publications, this says “hey, other people respect my opinion and you should to” – this is the power of social proof at work. For an idea on other tactics you can use to promote your content, check out this checklist. Blogger outreach is what makes the magic happen. Whether it’s reaching out via email or social media – outreach has been responsible for securing some incredible links/mentions. Effective outreach has enabled me to get featured on the likes of CIO.com, HuffPost, Boost Blog Traffic, KISSmetrics, Pro Blogger and more. The first 3 tactics that I’ll be talking about have been instrumental in increasing my search engine traffic but I’ve included a few more that can be especially effective. This all hinges on sending the right emails to the right people. Once you have found the right person to contact, you need to craft a well thought-out pitch. You need to make your email about the recipient, not you. Your pitch should highlight how you’ll help that person out and the more you help them, the more successful you’ll be. Helping is the new currency of the web. Don’t be the person that sends the pitch to someone they don’t know, asking them to give up their precious time for nothing in return. When we shift our focus to creating and developing a mutually beneficial relationship, we can get a lot more done. Relationships should never be one sided, there should always be give and take. It starts with relevancy – step back and take some time to think about whom you’re contacting and ask yourself “is this blog relevant?” This will ensure you don’t waste time and improve your overall results. Relationships matter – it’s all about who you know. If you don’t know the person, you need to get to know them. Start commenting on their blog, engaging with them on social media (that’s for starters) and it will make a huge difference. How much more likely would you be to open a message from a name you recognize rather than someone you don’t? A lot right?! And don’t just forget that person after you get what you want, remember the phrase “what else can we do to help each other?” and keep developing the relationship. Personalize your emails – show that you know who you’re talking to and you’re more likely to get a response. Be succinct – people are busy and that’s a fact. Keep your emails on point. Include a clear call to action – let people know what you are asking them to do. Make your offer irresistible – how you frame your offer is key, make it so good people can’t say no. Write to persuade – being an experienced copywriter will help here but if you aren’t, you can learn. We write sales pages and emails to our list to convert, why not outreach emails? For more help on crafting your outreach emails, check out this post. Now let’s take a look at specific tactics you can use right now. There has been a lot of talk about how guest posting is dead (mostly due to a post Matt Cutts wrote in early 2014). The truth is that low quality guest posting is pointless now but high quality guest posting is very much alive. Securing mentions on popular blogs that get traffic and engagement is incredibly effective. It requires writing engaging and high quality content as you should be doing already. You can also use guest posting to build your email list. Have you ever wanted to get featured as an expert on a site like HuffPost, Forbes, Inc.com or CNBC? It’s far easier than you think. All it takes is knowledge on a specific topic and a service to connect you to journalists (as well as other bloggers) who are looking for expert sources. I’ve had the most success using HARO (Help A Reporter Out) although SourceBottle is another free service that has a similar offering. I’ve only recently started using it but it seems like good source for additional opportunities. HARO and SourceBottle will send you a few emails each day with a list of potential opportunities. Journalists will have a query that they will need answering. Generally you will have a very limited amount of time to respond so it’s important to respond asap. I’ve used HARO to source opportunities for a group interview in the past and I ended up with 10 marketers working for law firms, all asking for links. So keep it relevant and don’t ask for a link. In most cases you’ll get one without asking. We could call this ego baiting, but that has such negative connotations. It’s an influence marketing tactic, but that doesn’t really say it all either. I like to call this the speed climb technique because it’s all about going from standing still to climbing your way to the top as fast as possible. What types of content work well for this? Group interviews tend to work especially well because influencers are invested in the creation of the post and there are plenty of other influential people involved. A while back I published a group interview called “43 Experts Share Their Top Tips To Grow Your Online Presence”. It received over 2,000 shares, links from 20+ domains and 4,000+ visits in under a week. The very first group interview I did, back when my blog was only around 6 months old still generated a few thousand visitors and almost 1,000 social shares. So you can make this work and the impact it will have on your blog in the future will be incredible. This isn’t just good for getting links, it’s great for increasing your authority, getting more traction on social media and most importantly – forging mutually beneficial relationships with other great people in your niche. Monitoring for broken links is generally something that gets forgotten by most website owners. The idea is that you find a relevant and authoritative piece of content with a nice amount of backlinks that is no longer accessible. Then create a similar piece of content on your own blog (this works best if your content is higher quality and more detailed). You can then find out which web pages are still linking to that piece of content, reach out to website owners, let them know the link is broken and recommend your content as a replacement. This works especially well because you’ve helped out the website owner by letting them know about a broken link and you’ve made it easy for them to switch out the link. Russ Jones has written an incredibly in depth guide on how to use broken link building effectively. This has been a popular link building tactic for a long time. Keep monitoring your progress and optimizing the process you follow to ensure you get the best results possible. There will be times when someone will mention your website or blog and won’t link to it. This presents you with an opportunity to reach out and ask for the link to be added. In a way, this is good from a user perspective too. Have you ever been reading a blog post only to find that the important links have been stripped out? That’s why this can work so well, it helps you but it also helps users. How can you monitor mentions? You can manage your outreach with a Gmail account and a spreadsheet but it gets far easier when you have purpose built tools to help you. BuzzStream was the first tool I used to manage blogger outreach. It can help you manage each step of the outreach process in the form of a handy web app with a browser extension to help you along the way. It has a database of blogs which is continuously being expanded and it pulls in some great data that’s focused around engagement metrics. This makes it much easier to identify blogs. There’s also some great reporting functionality which allows you to monitor the progress of your links/mentions by tracking traffic, social shares and other engagement metrics. This is an awesome new tool that has recently come out of beta. Ninja Outreach makes it very easy to find blogs and pulls in some extensive data which makes it easier to identify influential blogs. You can manage the entire outreach process with ease. By following the approach that I’ve discussed in this post you will be able to stay on Google’s good side. And in a way, just that alone will help to future proof your website’s rankings for a good while. The unfortunate truth is that there will be websites that will link to you and you’d prefer that they didn’t. These websites may end up impacting your rankings in a negative way. It may be because a website is scraping your content or it may be more sinister in nature. There are those that specifically target other sites (usually competitors) – we call this negative SEO. Google is getting smarter at detecting this but they haven’t completely got a handle on it yet. Whether it’s because of a negative SEO attack or a website scraping your content (or content of a site that links to you), it’s important that you take action. So what can you do about these nasty links? Your first step would be to identify which links could potentially cause harm to your site. Once you know which links could be harmful, you can contact webmasters to request removal and add them to Google’s Disavow tool (more on this in a moment). This is best being done on an on-going basis as the links are picked up rather than waiting a long time or until Google slaps you with a penalty. The easiest way to do this is to use a tool called Monitor Backlinks. It updates you on new backlinks, tracks keyword rankings and monitors your traffic using Google Analytics amongst other things. You can monitor links as they come in and use it to generate a disavow document which you can upload in Google Webmaster Tools. Monitor Backlinks starts from less than $20/month and goes up based on number of domains you want to manage, keywords and # of monitored links. It’s worth paying if you want to be able to manage links easily. Update: Ahrefs now has a backlink notification feature, and a lot more features. They have a large database of backlinks, so you can search for a domain and see a snapshot of their links, or you can enable notifications to get updates on new links. They also do keyword research and a bunch of other cool stuff. I won’t go into too much depth here, I could write a few more posts on this subject alone. You need to try to get links removed where possible. You probably won’t be able to get a lot of them removed but it’s worth doing because it will help you in the long run. It’s a fairly lengthy process unfortunately but there are tools like RMoov which will automate the process somewhat. It’s an especially useful tool if you ever get a manual penalty because the platform tracks your progress and records the emails sent so you can use it to submit a reconsideration request to Google. Once you’ve tried to get links removed, you will need to submit a disavow document to Google. Tools like RMoov and Monitor Backlinks will make this part much faster, but they can be straight forward to put together. It’s essentially a list of domains that you don’t want Google to consider when ranking your website. You’ll need a Google Webmaster Tools account in order to access it. Once setup, you can access it via this link. For some additional background information on how to use the disavow tool, Neil Patel has a good post worth reading. It’s time to stop approaching link building like it’s 2007. Google’s changed to the point where that sort of thinking can get you into trouble. We’re talking business burning trouble. Take risks with link building and use outdated tactics and you could skate under Google’s radar for a while. So keep the focus on quality and make the shift towards link earning. The best links will always be the ones that you don’t have to ask for – the ones that you earn because the content you’ve created blows every other resource on the topic out of the water.